Today’s Final Jeopardy answer (in the category Mythological Beasts) and game statistics for the Friday, March 16, 2018 game between Rahul Gupta, Dan Lee, and 2-day champion Peter Karamitsos. Today’s Final Jeopardy answer (in the category European Rivers) and game statistics for the Thursday, March 15, 2018 game between Amy Yacorzynski, Tracey Hollabaugh, and 1-day champion Peter Karamitsos. Today’s Final Jeopardy answer (in the category The Electoral College) and game statistics for the Wednesday, March 14, 2018 game between Peter Karamitsos, Allison Berke, and 1-day champion Zach Dark. 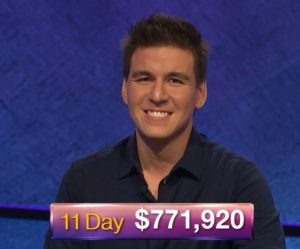 See who’s joining returning champion Mark Ashton on Jeopardy! this week! Eric R. Backes qualified 88.752% of the time. Anneke Garcia qualified 66.629% of the time. Lindsey Shultz qualified 33.041% of the time. Dave Leffler qualified 7.903% of the time. Jonathan Dinerstein qualified 1.064% of the time.